Beautiful Laurel floor plan in Overland Trail - one of Sun City Mesquite's favorite neighborhoods with oversized lots designed for executive sized homes. 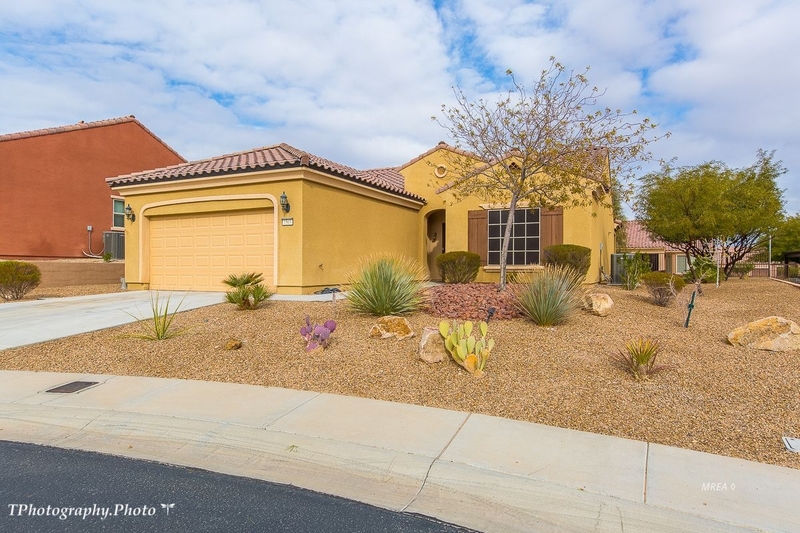 Huge back and side yards with beautiful desert landscaping - flanked by pavered pavilions, lush palm trees and flowering bushes - all low maintenance. Extended back patio is covered and shady, with room for entertaining and barbecues all year round. Open floor plan with windows all across the back of the home. Beautiful to look at and easy to care for, the large tile flooring is laid in all the living areas. Roomy kitchen with breakfast bar is open to dining room and great room. Crown molding accents the home.and the ceiling fans keep you cool. Gracious master bedroom with en suite bathroom, includes a garden tub, dual sinks and large walk in closet. Guest room with adjacent hall bath is on the other end of the home - excellent for privacy with your guests. Den can be used as an office. 2 Car garage has a work bench with cabinets - included! Sun City Mesquite is a 55+ active adult community with a magnificent recreation center, indoor and outdoor swimming, golf discounts, and more! Virginia Hepp (License# 0072173) with ERA Brokers Consolidated, Inc.